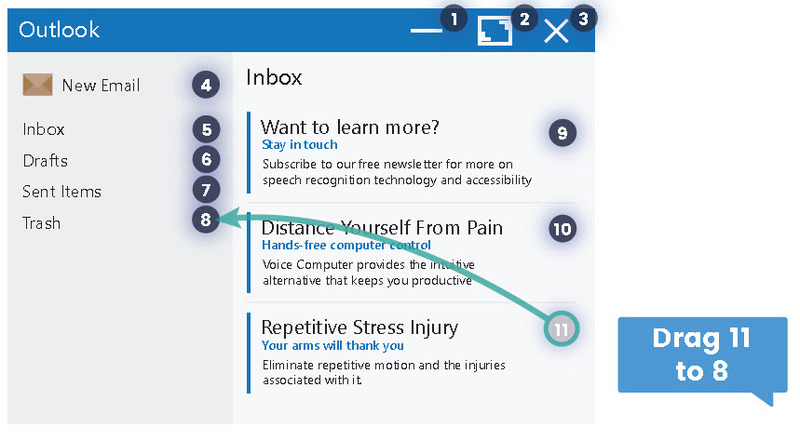 We make it simple for you to personalize speech control so it can be easier-to-use and more productive than ever. VoiceComputer’s proprietary Overlay (My Intags) technology lets you make any screen accessible with an incredibly easy-to-use voice template system. Fast. The simplest and fastest way to access and control previously inaccessible screens. Easy. Now you'll be able to easily access and control thousands of windows and screens that you could never access with just Dragon! No scripting or programming necessary! Control previously inaccessible applications just by following numbers! You can use our patented overlay commands to customize our speech interface so you can enjoy easy control of your previously inaccessible applications. Greater Accessibility. Our Intag technology breaks the barriers of active accessibility. Intag makes it easy to access and control previously inaccessible controls. Fast and Simple. We eliminated unnecessary commands. For example, our numbered overlays reopen after each command, simplifying control and letting you quickly control and drill through applications. Complete. Intag offers complete mouse control. You can issue any mouse command (click, double, right, & shift-click) and drag and drop, etc. Customizable. You can even create your own unique commands in our XML command files to use any combination of clicks and keys that you want. Note: Complex, mouse-intensive applications and databases may require our programmers to perform the customization. Create your own commands. No scripting. You can easily customize VoiceComputer commands without scripting or programming. Create keyboard and mouse commands without scripting. Create custom productivity commands in less than 30 seconds with Voice Shortcuts! Create Move to and Change to Folder commands for Outlook, Lotus, or GroupWise. Create Open from and Save to commands that let you instantly open and save files to your favorite folders and network drives. Our Intag commands can make any application accessible without scripting. VoiceComputer's Voice Shortcut commands make it easy to make productivity commands for routine, everyday tasks. And, for those occasions that you need to complex productivity commands, we can help you. We have more programming expertise than any other Dragon training company. Now you can quickly create favorite files and folders without scripting. Once you do this, you can use Open from and Save to commands to quickly open and save files to your favorite folders and network drives.